...it is important that we support those in battle with breast cancer and that we find a cure for this disease. LNE Consulting, Inc., a privately owned and operated sales company based in Hollywood, Florida, recently supported and participated in the 15th Annual Susan G. Komen Miami/Ft. 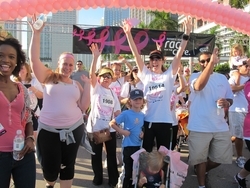 Lauderdale Race for the Cure, a charity organization aimed at helping woman fight breast cancer. The LNE Consulting team and President Julie Edmonds, began their support by collecting donations and raising awareness about breast cancer. They each personally donated and solicited sponsors to support them in the Race for the Cure. The race started early in the morning and the LNE Consulting team walked and finished the 5k race in about an hour and half. After completing the race, they walked around, visited company and organization booths, enjoyed music and food, and listened to sponsor testimonials in a closing ceremony. President Julie Edmonds thought the cause was important – and with two close family members who were breast cancer survivors, she encouraged the LNE Consulting team to rally for the cause with her. Follow LNE Consulting, Inc. on Facebook and Twitter. LNE Consulting, Inc. is a privately owned and operated sales company that has been in business since 1997. Their direct, professional, and friendly marketing approach has been successfully proven, as LNE Consulting, Inc. is considered a platinum partner by their present client. For more information, please call 954.963.4440 or visit http://www.lneconsultinginc.com/.